Tag line: "Step by step, Tim Conway and Don Knotts prove murder can be deadly! " I first saw The Private Eyes, a Sherlock Holmes-style spoof starring Don Knotts and Tim Conway, in our local theater back in 1980, though, if memory serves me, it wasn't the movie we set out to see. Originally, my father wanted to take my brother and I to another film (for years, I thought it was Jerry Lewis' Hardly Working, but now I'm not sure). The line for tickets stretched back a good forty yards or so, and when word reached us that the showing sold out, my dad bought tickets for The Private Eyes instead. In the end, I was glad he did because I thought the movie was hilarious, and I had a lot of fun watching it. Of course, I was only ten at the time, and after sitting down with it again today, I can honestly say that for anyone over the age of ten, The Private Eyes will undoubtedly be a tedious experience. Lord (Fred Stuthman) and Lady Morley (Mary Nell Santacrocce) have been murdered, and Scotland Yard assigns Inspector Winship (Knotts) and his associate, Dr. Tart (Conway) to investigate. With the help of the Morley's adult daughter, Phyllis (Trisha Noble), Winship and Tart question the household staff, including the nanny (Grace Zabriskie), the butler (Bernard Fox), and the Japanese chef (John Fujioka). The case takes an unexpected twist when more dead bodies turn up, and all the evidence suggests the "new" killer is none other than Lord Morley's ghost! Prior to this film, Knotts and Conway appeared together in a number of Disney-produced pictures, including The Apple Dumpling Gang (1975), Gus (1976), and The Apple Dumpling Gang Rides Again (1979). 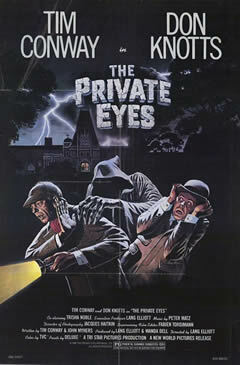 At first glance, The Private Eyes has a similar "family" feel to it, but unlike the movies listed above, this one was not intended for children; while certainly not violent, the various kills might be a tad disturbing for younger viewers, and some of the sexual innuendo will have parents of smaller kids squirming uncomfortably in their seats. But then, the jokes in The Private Eyes are so juvenile that only a child could appreciate them. So, what was this film's target audience? Aside from a few amusing scenes (one, in which Tim Conway sends a message to Scotland Yard by way of carrier pigeon and doesn't open the window first, made me laugh), The Private Eyes is a lifeless, dreary comedy that, by trying to please everybody, appeals to no one. My kids like it. It's a good introduction to black humor I suppose. I am watching this movie as I type. I also saw it at 10. I can tell you I totally disagree with you. watching this reminds me of the old Abbott and Costello films.While not the classics that try were. It still cracks me up. @Chop246: Thanks for the comment! I'm glad you enjoyed it. Personally, I found it far too juvenile, even more so than Abbott and Costello used to be. That would have been fine if this film was geared toward children (it does have the feel from time to time of being a kids-oriented movie, especially with some of the slapstick). But then there are a few sexually suggestive scenes, and some (borderline) disturbing kills, that are out of place in a "kiddie" movie. As I said, though, I'm glad you enjoyed it, and thanks again for taking the time to comment!